Charting AUD/NZD: A Turn in the Making? Since the middle of December, AUD/NZD has fallen more than 5 percent. The weakness of the currency pair is more a function of the problems in Australia than the strength in New Zealand. The floods in Queensland sent the Aussie tumbling as investors grew concerned about the impact on the economy. However over the past 3 trading day, AUD/NZD has found a bottom that I believe could become a more significant turn in the currency. In the near term, there is no major resistance until 1.31 but a move to 1.32 is realistic. Not only has AUD/NZD broken out of a downtrend, which I define using Bollinger Bands (discussed in Little Book of Currency Trading), but it has also cleared the 100-day SMA. New Zealand economic data has been soft and there is a possibility that retail sales tonight will disappoint as well. In Australia on the other hand, next week’s inflation report could show strong price pressures, restoring concerns about the need for tighter monetary policy. 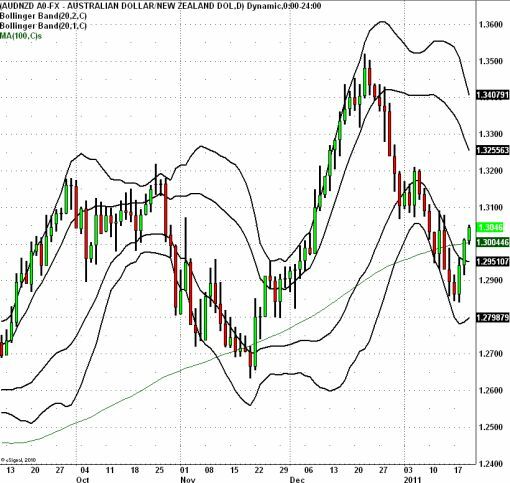 ← Head and Shoulders in GBPUSD?